Nick Guhl ’19 earned a Drew Medford Memorial Tournament Scholarship prior to spring break. The three-day scholarship event was established in honor of the former Paschal High School pitcher and TCU signee who was tragically killed in a car accident following his senior year of high school. To date, more than $44,000 in scholarships have been awarded. This year, $32,000 was awarded with $2,000 given to each school. Recipients are chosen by the various school’s coaches and embody the characteristics of Medford: drive to succeed, humility and empathy for others, and leadership on the baseball team. Read the Star-Telegram article. Student-athletes were honored on February 27, in the Winter 2019 Postseason Academic Awards program. 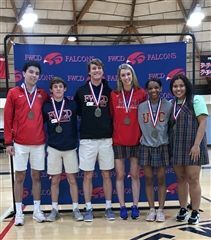 Pictured are SPC All-Conference award winners Humberto Zamorano ’21, Rogan Crumley ’22, Drew Chilcoat ’19, Kenzi Carter ’20, Kaitlyn Johnson ’19 and Liberty Croutch ’20. Our Varsity postseason awards were announced Wednesday, February 27 during an assembly in the Round Gym. Congratulations to all our teams and award winners. The Falcons had a great showing in SPC last week. The girls basketball finished in fifth place overall after defeating St. Andrew’s 44-30. Rogan Crumley ’22 was a silver medalist in his weight class in wrestling. Mac Toomey ’22 and Pearce Wallach ’20 finished fourth in their respective weight classes. Jacqui Cook ’22 finished fourth after 11 dives. Falcon swimmers made a splash in the pool. Josh Hurst ’21, Reese Nelson ’21, Alex Volpe ’21 and Chris Edwards ’20 set a new School record (1:50.27) in the 200 Medley Relay. Volpe placed fifth in the 200 Free and sixth in the 100 Fly with a new School record (54.07). Hurst placed fourth in the 500 free with a new School record (5:01.73). Ainsley Hilliard ’20 finished eighth in the 100 Back. Hilliard and seniors Adriana Barker, Grace Wagner and Elle Hurst placed seventh in the 400 Free Relay. Kenzi Carter ’20 was named Girls Basketball Co-Player of the Week (January 28-February 1) with LD Bell’s Myra Gordon. Each scored more than 35 points in their respective games. In FWCD’s game against The Oakridge School, the Falcons were trailing by 15. Kenzi scored 18 points in the final quarter to help lead the team to a 55-51 victory. View the Star-Telegram article. FWCD Wrestling Coach Hugo Munoz is featured in the Spring 2019 issue of Tarrant County College Reach Magazine. In the article, Munoz talks about his dream to become a teacher, and the path he took to get there. Munoz is a teacher at Diamond Hill Elementary School. Read "Turning a Dream into Reality." At Falcon Frenzy on Friday, January 25, six Lower School students cheered at the varsity boys basketball game alongside the Falcon varsity cheerleaders. Emery Estes ’30, Charlotte Lamsens ’29, Katherine Walker ’30, Kathryn Huff ’29, Vivi Sell ’30 and Margot Smith ’31 won the experience in October when their name was pulled during the Carnival Assembly.